Powering the 2017 Super Duty chassis-cab line is Ford’s optional, second-generation Power Stroke turbodiesel V8 engine, which is upgraded with 30 more horsepower and 90 extra lb-ft of torque for a respective total of 330 hp and 750 lb-ft. It comes mated to Ford’s 6R140 six-speed automatic transmission. INDIANAPOLIS—Responding to the need for more specialized, rugged and capable work trucks such as aerial lifts, field-service vehicles and medium-duty haulers, Ford Motor Co. is debuting a new chassis-cab model of its aluminum-bodied Super Duty trucks at this month’s Work Truck Show. 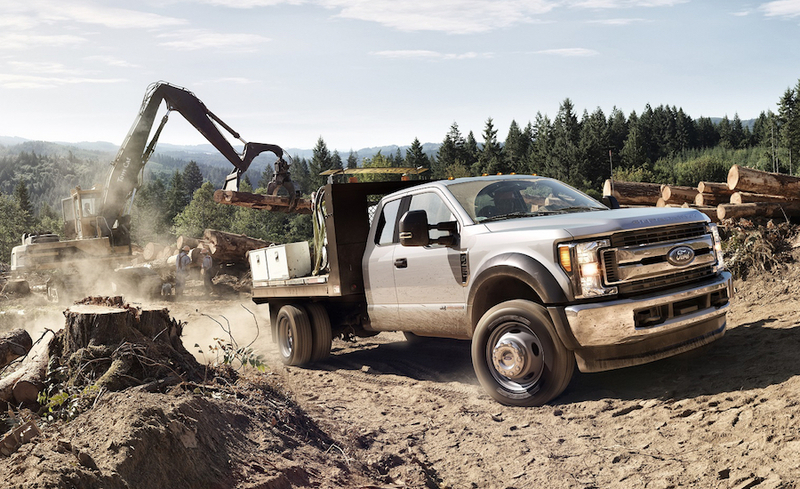 Employing a new, high-strength, aluminum-alloy cab and a higher-strength steel frame than the outgoing generation, the 2017 F-350, F-450 and F-550 chassis-cab lineup offers best-in-class capability, Ford claims, with a front gross-axle-weight rating of 7,500 lb. and a gross-combined weight rating of 40,000 lb. When the box-off trucks go on sale this fall, they will be available in regular, extended and crew cab configurations. Pricing has not yet been announced. Powering the new Super Duty chassis-cab line is Ford’s optional, second-generation Power Stroke turbodiesel V8 engine, which is upgraded with 30 more horsepower and 90 extra lb-ft of torque for a respective total of 330 hp and 750 lb-ft, which Ford claims is class leading. It comes mated to Ford’s 6R140 six-speed automatic transmission. Standard gasoline engines include Ford's 6.2-liter V8 for the F-350 and a 6.8-liter V10 for the F-450/550. Ford says it is confident that durability of the new aluminum cab has been thoroughly addressed through thick-gauge material and extensive product testing. The Work Truck Show, which the trade group NTEA organizes, runs March 1-4 at the Indiana Convention Center and covers more than 500,000 sq ft of exhibit space.